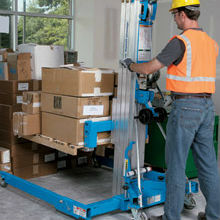 With three base models and many accessories to choose from, the Genie® Lift™ is ideal for all your material handling needs. 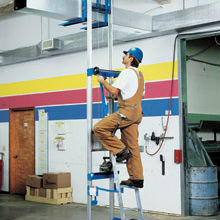 The Genie® Super Tower™ is the industry standard for theatrical productions and entertainment events. The standard ﬂat black anodized ﬁnish blends in perfectly backstage, making it virtually invisible to audiences. 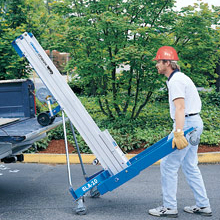 The Genie® Superlift Advantage® is a manually operated material lift with multiple base, winch and load handling options to create just the lift you need. 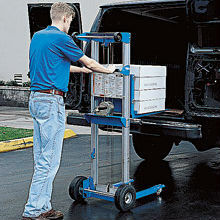 The compact, portable design rolls through standard single doorways and loads easily into a pickup truck. With so many choices, the versatile Genie® Superlift Advantage® helps you increase productivity and value for your money. 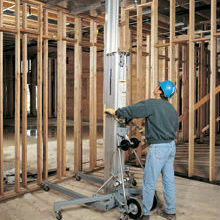 The Genie® Superlift Contractor® is well suited for industrial applications and HVAC installations. 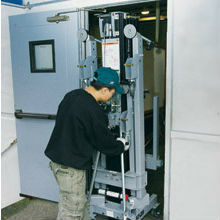 This unit can be easily operated by one person and can lift, lower and move loads up to 650 lbs.